The sun was slowly setting over the hunting camp with its bright pink lines cutting through the cool October sky. 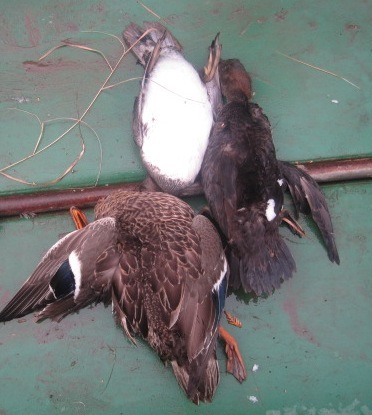 Six field dressed ducks sat in the freezer as our duck hunt had come to an end for the day. Now we were all sitting around the table sharing stories, laughs about family, life and the day’s hunt. Each of us with our cold drinks, and various snack bags, bottle caps littered the table top along with a chipped crystal clear ashtray where seniors’ cigarette was smoldering and its smoke was spiraling into the ceiling fan. Wet pants hung on the line right above the wood burning fire-place, and the boots stood neatly by the door. In the morrow, we would set out for the wetlands again, so I took a few minutes to clear the shotguns outside and put a light coat of oil on them before calling it a night. During my quick cleaning, I grabbed my Remington 870 pointed it in a safe direction cleared the shotgun running though the action to activate the ejection steps, nothing came out since it had already cleared twice before down by the creek. Always treat a gun like it is loaded eh! I inspected the chamber first visually and then with my fingers and also checked the tubular magazine making sure it was also cleared. Once I deemed it safe, I squirted a few drops of Break Free oil on some swabs and gently covered all metal parts of the shotgun. I then proceeded to use my cleaning rod and pulled through the barrel several times first with my wired brush and then with a lightly coated swab, then with my shotgun barrel cleaner. The action was pulled back to the rear of the receiver and the shotgun was aimed down on an angle, so that I could see down the barrel; it can be difficult to see if the barrel is clean and cleared of swab lint, gun powder residue or debris, depending on the lighting. Break-Action shotguns are much easier to look down the barrel once you have pulled through with the cleaning rod. My friend handed me a piece of white cloth and I placed it at the back of the receiver, so that I can still see in through the ejection port. I then turned the gun around and looked down the barrel. Having the white cloth or even a white piece of paper allows light to reflect and now I could see clearly down the barrel with the outside light. It was all clean and free of any obstructions, ready for the next outing. I always practice the ACTS & PROVE when handling a firearm or preparing it for cleaning. See that the firearm is unloaded – PROVE it safe. You are standing still surrounded by the elements feeling cold and fatigued, ready to go home after eight hours in the wilderness. The sun is going down quickly and is now just resting above the tree tops of the dark evergreen and there is a heavy snowfall starting to come down. It is still light out but the visibility is now only thirty meters because of the snow and you must now make your way to the car safely. The small map and compass are still in your pocket and you set a course to the west and begin walking quickly through the bush. A few minutes later you stop and check your direction travel and come to a startling realization that you are back at the same spot where you started. You have no signal on your phone and the nearest safety shack is twenty-five kilometers away and winter is only a few weeks old. Luckily you knew the main road ran north to south and you had to head left or west to get to the road. You pull out the compass and set it to true north and then go west. You made it! We came out about fifty meters south of the car and I was truly annoyed that something like this would occur to someone who is comfortable and knowledgeable in the woods. Ego prevented us from taking out the compass sooner and for a while we were lost only forty meters from the dirt road. It happened so quickly, even to experienced people. Let us look into this story and try to understand and identify important knowledge skill sets that are a must in order for you to enjoy your hunt worry free and come home safely. If you are a tracking hunter, the last thing you want to do is spend half of your time trying to find yourself on a map. I know that when I am in the bush and I find a small game trail to follow, I can easily walk several hours or more and I do not want to constantly worry about getting lost. When we read my story and look at what happened, the first thing I identified is that combined with my ego, I under estimated the dangers and failed to call on my hardware when I truly needed it, in this case it was the compass. A great friend of mine used to be an elite army scout and he had always taught me to trust your equipment and if used properly you would always find your way. Once we pulled out the compass and set out to the West we were fine in a matter of fifteen minutes, unfortunately there are hunters and hikers that are not so fortunate. Therefore I ask the same question as the author Bill Riviere: What is the difference? Bill gives us the answer, it is experience. Even expert woodsman or seasoned hunters get lost in the woods and it is because they have confidence in their abilities and this along with their experience eliminates the fear allowing them to think clearly. The second thing I identified is that you must trust yourself as well as your knowledge and practice your navigation skills. The author Bill Riviere actually suggest finding a small wooded area in a state park or forest and allow yourself to get lost and spend the night out, practice you bush craft skills and then head back home the following day with the help of a compass and map. Nowadays, you could use your Backtrack or GPS. This is to be done with careful consideration and not just anyone should do this and alone would not be recommended. The sooner you accept that you are lost and start working toward a solution the better off you are. Now you either find your own way out of the woods or you can accept the fact that you are lost and setup camp if it is nearing the end of the day. Start preparing a fire, lean-to and light up a pipe for comfort as Bill mentions in his book as someone is bound to come and find you. -Always carry enough water and food or snacks in a day pack. -Get a small pocket-size first aid kit and add water proof matches and starter sticks to the kit. Also include a knife and a small field axe if you are leaving for several days. -Always carry a back up compass if you are using a GPS or Backtrack and carry spare batteries + topographical map or satelite photo map. -If you are lost in the morning, you may attempt to find your way home if you are confident with your navigation skills. If it is late in the afternoon and you are starting to lose hope and panic is setting in, prepare yourself to spend the night. Setup a Lean-to, build a fire and find evergreen boughs to make a layer between you and the ground. Stay warm, dry and keep occupied. When I was sixteen, I spent three days in the woods alone during a wilderness survival course. One of the biggest challenges I found was keeping my mind from racing, so I kept busy building my lean-to making my living space more comfortable and hunting small game for food making sure not to wonder too far from my site. There are tons of great websites and books available in order to teach you the basics of bush craft. -Learn and master alternate ways to navigate such as using the stars, sun and wind. One of my favorite is the “The Shadow-Tip” method using the sun, two sticks and pebbles and roughly in fifteen minutes you have found north, south, east and west. -Leave a detailed map of where you will be hunting with emergency contact information and advise your family or friends to come looking for you if you do not contact them or come home within a set time and date.